Pecan tree nurseries all over the US provide consumers with a wide selection of pecans that come in a variety of shapes, sizes, and even depth of color. Pecans are widely known for their use in a variety of delicious desserts and delectable dinners, but did you know that pecans also have countless health benefits? That’s right, not only are they delicious to eat, they also have excellent nutritive value–minerals, antioxidants, and vitamins–that helps treat a broad range of health, skin, and hair concerns. Promotes High Energy and Weight Loss: Pecans provide consumers with a healthy fat that assists in elevating energy levels and promoting weight loss. To assist in weight loss, the healthy fats of pecans greatly impact ghrelin, a hormone that–in high levels–can elevate the stress levels that contribute to our desire to eat large amounts of food. Additionally, pecans contain healthy levels of manganese and copper that assist in weight loss. Manganese helps to reduce weight in men and women while copper helps with maintaining high energy levels. Copper helps the body achieve a fast metabolism while creating proper levels of ATP (adenosine triphosphate), the body’s greatest source of energy. Can Reduce Symptoms of PMS in Women: Ladies, pecans can be your saving grace during those unpleasant occurrences of PMS. In addition to its weight loss benefits, the presence of manganese can also reduce common PMS symptoms such as cramping and mood swings. This is especially true when manganese intake in combined with calcium. Promotes Cardiovascular Health: Pecans are notorious for being full of fiber, a nutrient that promotes excellent heart health. Delivering superb levels of fiber, pecans can greatly reduce the risk of coronary heart disease, coronary artery disease, and strokes. In addition to being rich in fiber, pecans also contain monounsaturated fats–oleic acid–and phenolic antioxidants that are extremely beneficial for your health and protect your heart from diseases–keeping it healthy and regulated. Researchers believe that the nutrients of pecans can prevent diseases such as coronary heart disease through the means of preventing the oxidation of blood lipids. So, to promote great heart health, add a serving of pecans to your diet each day! Has Anti-Aging Qualities For Your Skin: Contained within these delicious, little nuts are an abundance of antioxidants that help to improve the complexion of one’s skin while promoting a clear complexion. Some of the many vitamins and antioxidants that pecans have are ellagic acid, vitamin A, and vitamin E. These specific vitamins and antioxidants fight against free radicals–the greatest cause for the aging of skin. Due to this, pecans help to prevent fine lines, wrinkles, and discoloration of the skin. In addition to its anti-aging qualities, pecans are filled with zinc, a mineral that helps skin maintain its clear complexion–fighting against signs of acne breakouts. 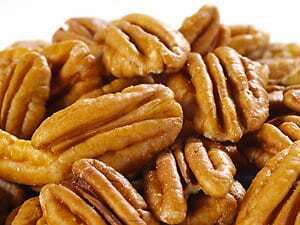 Even the fiber in pecans can rid your skin of toxins, ultimately improving the appearance of your skin. Prevents Hair Loss: Pecans rich in amino acids that contribute to the growth of full, healthy hair. By promoting healthy blood flow, hair roots are able to grow and prosper within the scalp. Additionally, the nutrients of pecans can assist in the prevention of hair loss as well. Pecans are a great source of iron, and iron fights against anemia, the number one contributor to hair loss. With healthy levels of iron, blood iron will increase and fight against hair loss. Though they are tiny, pecans are filled with vitamins, antioxidants, and nutrients that provide a consumer’s body with a variety of health benefits. Visit your local pecan tree nursery for some of the best pecan tree sales and varieties! Settled in the heart of Valdosta, Georgia, you’ll find 140 acres of rich farmland dedicated to one thing: growing pecan trees. For more information on bareroot and container pecan trees for sale, contact Georgia Pecan Nursery, today!